WCF is abbreviation of Windows Communication Foundation. 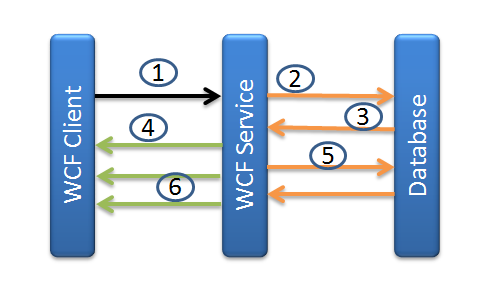 WCF is a framework used to build, configure, and deploy network-distributed services. Earlier it was known as Indigo. It enables hosting services in any type of operating system process. WCF has a combined features of Web Service, Remoting, MSMQ and COM+. WCF provides a common platform for all .NET communication. WCF supports interoperability as an elementary feature. It is one of the latest technologies of Microsoft. It is used to build service-oriented applications. It is based on the concept of message-based communication. Here HTTP request is represented uniformly. WCF makes it possible to have a unified API irrespective of diverse transport mechanisms. Windows Communication Foundation (WCF) enables applications to communicate whether they are on the same computer, across the Internet, or on different application platforms. The Data Contract describes every parameter that makes up each message that a service can create or consume. The Message Parameters are defined by XML Schema definition language (XSD) documents. It enables any system that understands XML to process the documents. The Message Contract defines specific message parts using SOAP protocols. It allows finer-grained control over parts of the message, when interoperability demands such precision. The Service Contract specifies the actual method signatures of the service. It is distributed as an interface in one of the supported programming languages, such as Visual Basic or Visual C#. Policies and Bindings stipulate the conditions required to communicate with a service. Policies include security requirements and other conditions that must be met to communicate with a service. Service Runtime layer contains the behaviours that occur only during the actual operation of the service. Throttling controls how many messages are processed. It may vary if the demand for the service grows to a preset limit. Error specifies what occurs when an internal error occurs on the service. Metadata governs how and whether metadata is made available to the outside world. Instance specifies how many instances of the service can be run. Transaction enables the rollback of transacted operations if a failure occurs. Dispatch is the control of how a message is processed by the WCF infrastructure. Extensibility enables customization of runtime processes. Parameter filtering enables pre-set actions to occur based on filters acting on message headers. Messaging layer is composed of channels. A channel is a component that processes a message in some way. Channels operate on messages and message headers. There are two types of channels: Transport channels and Protocol channels. Transport channels read and write messages from the network. Some transports use an encoder to convert messages, represented as XML Info sets, to and from the byte stream representation used by the network. Examples of transports are HTTP, named pipes, TCP, and MSMQ. Examples of encodings are XML and optimized binary. Protocol channels implement message processing protocols, often by reading or writing additional headers to the message. Examples of such protocols include WS-Security and WS-Reliability. Message layer illustrates the possible formats and exchange patterns of the data. WS-Security is an implementation of the WS-Security specification enabling security at the message layer. The WS-Reliable Messaging enables the guarantee of message delivery. Encoders present a variety of encodings that can be used to suit the needs of the message. HTTP specifies that the Hypertext Transport Protocol is used for message delivery. TCP specifies TCP protocol is used for message delivery. Transaction Flow governs transacted message patterns. Named Pipe enables inter-process communication. MSMQ enables interoperation with MSMQ applications. A service is a program. It must be run in an executable. This is known as a self-hosted service. Services can also be hosted, or run in an executable managed by an external agent, such as IIS or Windows Activation Service (WAS). WAS enables WCF applications to be activated automatically when deployed on a computer running WAS. Services can also be manually run as executable (.exe) files. A service can also be run automatically as a Windows service. COM+ components can also be hosted as WCF services. Step1: Open Visual Studio in your PC. Step3: Select Visual C# > WCF > WCF Service Application. Name your application click OK.
Step8: Set host application as start-up project and run to check whether it is working fine or not. Step12: run the application. Whatever you are going to type on text box, it will be written with Hello prefix as Label text. Was this article helpful? Must share your views on comment section below. Nice post. I was checking continuously this blog and I am impressed! Very useful info specially the last part 🙂 I care for such information a lot. I was seeking this certain info for a long time. Thank you and best of luck.